Which material is best for your new pool fence? Learn some of your options below! An extremely important part of owning a swimming pool is safety. By investing in a strong fence for your pool, you can be sure that your family and guests can enjoy your landscaping safely. Pool fences also allow you to add privacy that can allow you to enjoy your pool without unwanted attention from neighbors and passersby. But choosing the right pool fencing can be intimidating. After all, how do you keep your pool area safe, secure, and stylish while still enjoying the rest of your outdoor space? Here are 3 fencing materials that are perfect choices for your new pool fence. Wooden fences are great choices for landscaping due to their natural look and versatility. With a wooden fence, you’re sure to find something to meet your unique needs and specifications. Wooden fences are also great for privacy fencing, making them an excellent choice for any pool area. With the proper maintenance, your wooden fence will look stylish and boost privacy for years to come. Another great choice for residential fencing is aluminum. Thanks to its low maintenance needs and durability, aluminum fencing is great for an ornamental pool fence. Aluminum can give you the look of a wrought iron fence without all the tricky maintenance that comes with it. Consider these fences for a stylish landscape to add an elegant touch to your pool area. These fences are great for pools in a more private lawn or an outdoor oasis with style. Since they have increased visibility, aluminum fences are also a great option for pools with a view. Enjoy the landscape around you with an ornamental fence for your pool. Steel is one of the most popular choices for residential fencing materials. This is due to its high durability, low maintenance, and versatility. Steel fences are strong and able to withstand plenty of weathering without requiring costly repairs, and they are secure enough to keep your pool area safe. With versatile fencing design, you can also find steel fencing that resembles a more ornate wrought iron design, allowing you to get the most out of your pool area. 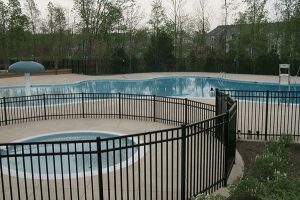 With steel fencing, you can be sure that your pool fence will be strong, durable, and stylish to fit your unique needs. No matter what type of fence you have decided on, Hercules Fences has the expertise and equipment to construct your dream fence. Our experienced team can help meet your fencing needs, whether they are residential or commercial, for the right price. We proudly serve Albemarle County, Amelia, Ashland, Augusta, Buckingham, Caroline, Charles City, Charlottesville, Chester County, Chesterfield County, Colonial Heights, Cumberland County, Dinwiddle County, Fluvanna County, and Fort Lee, Virginia, VA. Give us a call at 804-752-7992 or visit us online. To see examples of our work and keep in touch, don’t forget to follow us on Facebook, Twitter, Google+, LinkedIn, Flickr, and Pinterest. This entry was posted on Friday, April 5th, 2019 at 10:59 am. Both comments and pings are currently closed.